Government representatives and security experts in the Baltic states and Poland don’t trust NATO to come to their defense if they are invaded by Russia, according to a new study on the security challenges facing the alliance’s eastern flank. The Center for Strategic and International Studies, a Washington, D.C.-based think tank, collected opinions from leaders in the Baltic states and Poland on the security situation in Eastern Europe. Its survey found great concern about Russia’s developing military force, cyber capabilities, and propaganda campaign. Representatives of NATO allies in Eastern Europe also exhibited a "surprisingly prevalent distrust of NATO ever reaching consensus on an Article 5 response in the event of a Russian attack on allied territory in the east," according to the report chronicling the findings, which was released this week. NATO’s founding treaty states in Article 5 that members of the alliance are required to defend each other militarily, so that "an attack against one Ally is considered as an attack against all Allies." The principle was invoked for the first time after the September 11, 2001, terrorist attacks on the United States, precipitating the war in Afghanistan. The study was conducted between late 2015 and May of this year, before NATO finalized a deal to deploy four multinational battalions to Estonia, Latvia, Lithuania, and Poland on a rotational basis beginning next year. While NATO’s planned buildup was meant to restore confidence along its eastern flank, the study reflects a reluctance among the Baltic states and Poland to trust its Western allies to intervene if one of the countries is invaded by Russia, which invaded Ukraine in 2014 and Georgia in 2008. "Our discussions exposed an underlying skepticism toward the timeliness of NATO’s decision-making mechanisms, and, relatedly, pervasive doubts regarding the level of political will that would be needed to reach a consensus for action," the researchers wrote. "Our discussions also revealed resentment of a perceived Western assumption that defense of the Baltics is impossible and that a fight for liberation after a successful Russian invasion and occupation would most likely be required," they wrote. "In such a case, several interlocutors questioned whether allies would fight at all and, moreover, whether Article 5 could really be relied on in an alliance-wide context." Concerns over Russian aggression have grown following Moscow’s invasion of Ukraine and annexation of the Crimean Peninsula in 2014. NATO’s planned buildup in Eastern Europe is intended to deter Russian provocations, and has drawn the ire of Moscow. 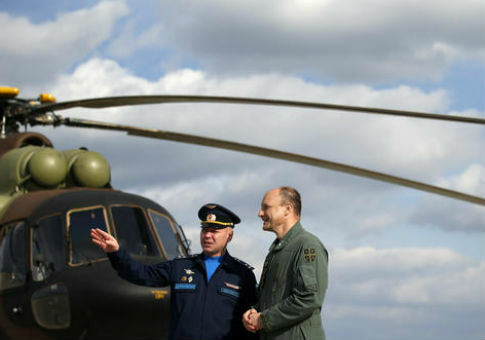 Russia has pledged to create new military divisions to counter NATO’s deployments and recently bolstered forces in Kaliningrad, its sliver of territory bordering Poland and Lithuania. Tensions between Moscow and Washington have increased in recent weeks as a result of the conflict in Syria, where Russia is fighting to prop up Syrian dictator Bashar al-Assad. The U.S. government last week formally accused Russia of hacking into American political institutions, including the Democratic National Committee, to influence the presidential election. Hours later, Moscow moved nuclear-capable missiles into Kaliningrad. Fear of cyber, military, nuclear, and other threats from Russia are particularly high in the Baltic states and Poland. In recent years, Russia has strengthened its military posture near the Baltics by staging ground and air exercises near its border with NATO nations and stationing fighter jets at an air base in Lida, Belarus, near the border with Poland and Lithuania. Eastern European leaders who participated in the study worried about Moscow’s "conventional military advantage" over their much smaller forces. "The anxiety over Russia is compounded by the region’s insecurities over U.S. and Western allies’ level of commitment to collective defense," the researchers wrote. Government officials, experts, and others singled out Russia’s commitment to develop its forces to better compete with Western forces. U.S. military leaders have identified Russia and China as near-peer competitors in terms of military strength. "Another aspect of the Russian military that stood out as a source of frequent concern was Moscow’s continuing prioritization of defense modernization despite domestic economic challenges," the study found. "There was a widespread perception that the Russian military is only getting better." Eastern European powers have been rattled by Russia’s "snap" military exercises, which have been conducted with increased frequency in the region, according to NATO’s deputy secretary general. According to the report, some experts fear that the frequency of these exercises will "numb" NATO partners to major moves by Russia. "Several experts we spoke with from the region emphasized their fear that Russia’s constant use of snap exercises would lead to a numbness among allies to massive Russian troop movements," the researchers wrote. "In the words of one interviewee, ‘If the alert is constantly blinking red, we go off guard. This is when Russia will turn an exercise into an operation.’"
Researchers found that study participants were more confident about their security relations with the United States than with NATO, but they detected concerns about "the perception that the United States, which has long acted as a balancing force in European politics, has retreated from its traditional leading role in forging common transatlantic approaches to diverse political and security challenges." While the Baltic states and Poland have long asked for permanently deployed NATO forces, the report noted that the countries are "likely quite satisfied" with the deal for four rotational battalions inked at the Warsaw Summit in July. These deployments, along with the U.S. military’s presence in Central and Eastern Europe, are very likely to boost confidence in the region with respect to deterring Russian aggression. Still, some have argued that the NATO battalions, which will number 1,000 troops each, will fall short of deterring Moscow and enabling a quick response to conflict. According to Russian media reports, Moscow’s three planned divisions in its western and southern military districts are expected to number 10,000 soldiers each.